Welcome to the latest step in Dr. Garlic’s travel! The amazing Doctor is still in the Icy Wastelands; this place is called Ice Block Trench. For good reasons, too: it is a trench-like valley! Dr. Garlic found the terrain of the trench to be much less hospitable than even the rest of the Wastelands. 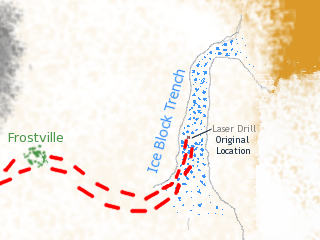 The (increasingly plentiful) ice blocks, for which the trench had been named, proved to be one of the most difficult obstacles in his journey thus far. These massive chunks of frozen water are slippery (and as such, hard to climb), blindingly white, and shinier than a newly-minted coin. But hey, at least Typhon was only up against inanimate ice blocks, instead of, say, a mystical ice snake. Just when Dr. Garlic was beginning to think he would be unable to get over (or around) a monstrous blockade of ice which obstructed his path, he happened upon something most unexpected. 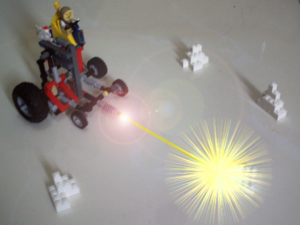 An abandoned LaserDriller 3000! Attempting to reach the controls of the huge vehicle. I continue my trek through these Icy Wastelands … I wonder how much longer it will be. At least now I need no longer walk on foot through the trench, seeing as I’ve got this LaserDriller 3000 now. 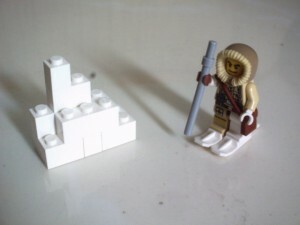 I came across it while pondering how I would ever scale the nearly-vertical ice wall in front of me. Recognizing it (I’ve used one before and have a license to operate them), I realized it had been abandoned and decided to use it to cut a safe path out of the ice. Unfortunately, it was missing most of its ladder. 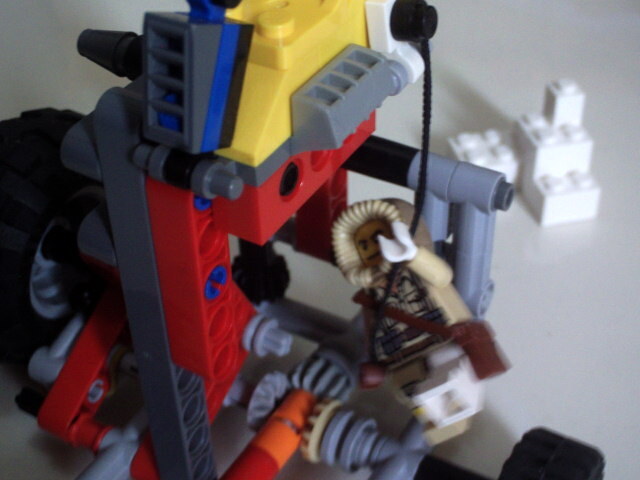 The seat is quite high up there, so I knew I had to jump to reach the last shreds of one of the ruined ladder’s ropes. However, because it is Leap Day, I was able to jump higher than usual and managed to pull myself atop the fun thing! Now fun abounds and I am making steady progress through the trench. There’s actually a pretty cool mechanism in the vehicle which lets you either drive the rig forwards or turn it to the left, based on which direction the (currently imaginary) motor is spinning. 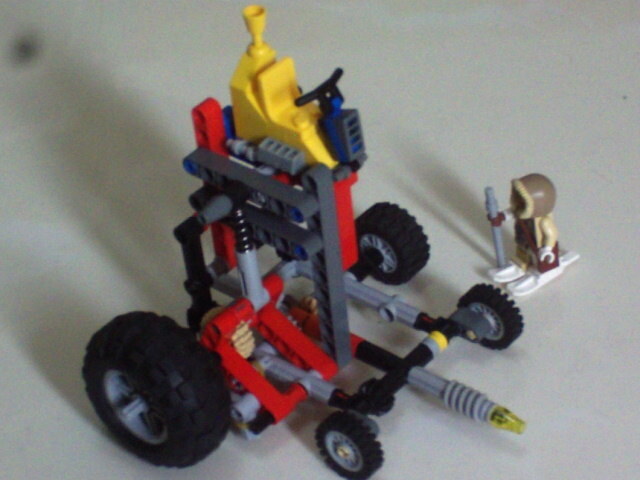 It’s loosely based on a design from the LEGO Answers website and can be found here. A detailed map of Typhon's current location. Well, that’s (almost) all; thanks for reading! A helpful reader alerted me to the shocking fact that there has been some errors when trying to post comments. It turned out to be related to a conflict between what a certain plugin was trying to read and the information WordPress was giving it. Something like that. However, that’s all fixed now, so leave your comments in the aptly named comment section. Yea! The comment section is fixed! WHOOPIE!!! No WONDER why I couldn’t comment. Must be apart of the blog taking over itself. Taking over itself?! Please, no! Anything but that!